Don't Back Into has newspaper mention! Don't Back Into the Palm Tree! Real Life Lessons for New and Wannabe RVers has received mention in Jacksonville's Sunday Time-Union! Based on posts to this blog, Don't Back Into the Palm Tree! 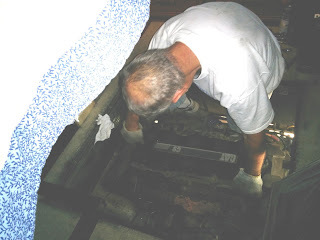 is a personal "confession" of the mistakes my husband, Jim, and I have made during our first five years of RVing. But, it doesn't stop there. Rather, we provide recommendations to new and wannabe RVers on how to avoid those commonly made mistakes. The aim of the book is to make RVing an enjoyable experience--not one new owners will regret. The book is available on Amazon.com, in both Kindle and paperback editions. We live in Northeast Florida, where temperatures hover in the low 90's from the end of May through the first or second week of September. That wouldn't be so bad, except that the humidity usually matches the temperature. Fortunately (for our electric bill) Jim and I are comfortable keeping the indoor temperature at about 80 degrees. The AC takes out the humidity, and overhead fans circulate the air. When we are in our motorhome, keeping cool is more of a challenge. The air conditioner runs almost all of the time when the outdoor temperatures escalate. Despite the laboring AC, we manage to keep cool, even when our cantankerous back AC decides to quit on us. Not so, our engine. Last year, when we were traveling toward the midwest, we began to experience overheating. Jim would keep maintain a lower speed, to keep engine RPMs down, but when we were climbing mountains, the engine worked hard--very hard. Once or twice we had to pull over and let the motor cool down. I believe it was in Macon, Ga., that Jim did some detective work and found out that a dirty radiator might cause overheating. As best he could, he hosed down the radiator. The engine seemed to work better, but we still would occasionally experience the temperature gauge creeping up to an unsafe level. Jim had hoped that the overheating problem would improve once he had repaired the rusted-out exhaust pipe, which was attached to the manifold. With the work on the exhaust system done, last week we took Junior out for a test drive up I95, to see if it would run cool. It did not. The overheating problem persisted whenever he went over 60 mph--and that was without towing the car. Replace the thermostat every couple of years. According to the experts, their efficiency can be affected by age. Maintain antifreeze levels at a 50-50 (antifreeze to water) mixture--even in Florida. Too much antifreeze reduces the coolant's ability to keep the engine cool. Well, when I read Jim this finding, he started thinking: He had been topping off coolant levels with pure antifreeze. When he checked the specific gravity of the antifreeze, it was too high (too much antifreeze)! So, he diluted the antifreeze with water. He also replaced the thermostat. 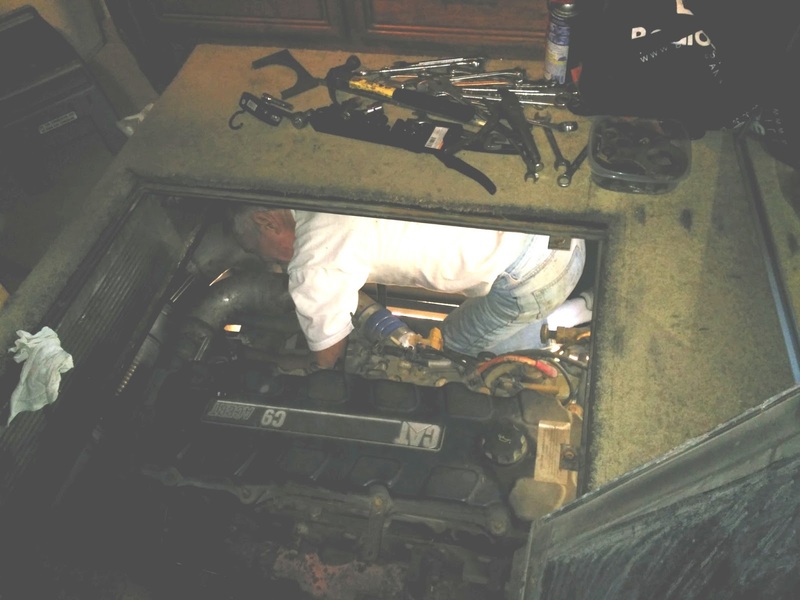 Once he had diluted the antifreeze and replaced the thermostat, it was time for another test drive. This time...success! Jim pushed the speedometer up to 75 mph. The engine never overheated. Yea! Now as we keep our cool, so will Junior's engine. P.S. You can learn more about our (mis)adventures in Don't Back into the Palm Tree! 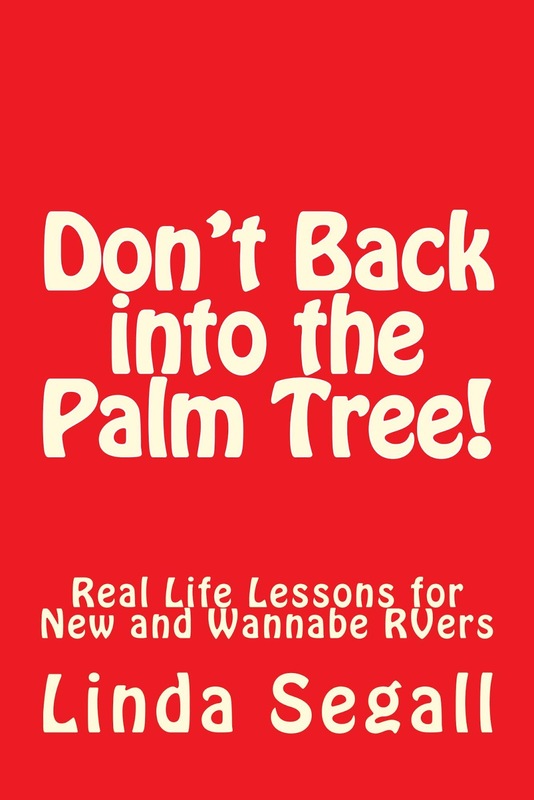 Real Life Lessons for New and Wannabe RVers, available now as an e-book or in paperback on Amazon.